Our Mission: Providing visionary health protection. Employee Health is Our Priority! Did you know that the Occupational Health Clinic provides a wide array of programs to protect workers exposed to hazards ranging from hazardous chemicals to excessive noise? Our screening programs detect early health effects such as allergies from working with animals, hearing loss from noise exposure, and many others. 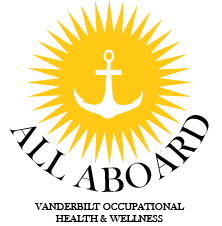 Learn more about the different preventive exams and screenings we provide to keep Vanderbilt workers safe. Before your first day of work, we want to make sure you have all you need to maximize your productivity and well-being. We provide required health services to protect you at work, and services to promote health and build resilience. Incoming VUMC staff may receive these services before their first day of work by attending ALL ABOARD. New faculty and housestaff receive these services during their orientation. Learn more about ALL ABOARD , including ways to get compliant if you can't make an event. Need an immunization or test for compliance? OHC provides many convenient options for Vanderbilt faculty and staff. Drop by The Occupational Health Clinic at Suite 640 in the Medical Arts Building between 7:00 a.m. and 6:00 p.m.. No appointment needed for current employees. Visit one of our many convenient OHC Comes To You events. To find out more about OHC's many flu vaccine events across campus please visit our Searchable Flu Calendar. Send information to OHC using these fast and easy electronic tools. TB Skin Testing: Learn more or if you are a designated tester order supplies. Easy Reader: Learn more or log in to enter a TB skin test result. Immunization Exemption Request: Individuals may request an exemption through this HR site. However, for everything but influenza please TALK with an OHC nurse first! Often we can help find an alternative to vaccination. Animal Allergy: Learn more about occupational animal allergies, or complete the allergy survey. Offsite Clinic Immunizations: Learn more about vaccines besides flu that can be given by offsite clinics, or document vaccines given. Compliance Reports: Need to know how to access to compliance reports? Visit our Verifying Compliance page for all the info.